Mexico City is at the bottom of the list of rent-affordable places to live among the world’s great cities. The question is simple: what are the world’s best cities for renters? Coming up with an answer is where things get somewhat more complicated—what sets a good city apart from the rest, after all? Something most of us can agree upon is that a great city must present a good deal of opportunities to its population. It also certainly doesn’t hurt if you can afford living there. We already looked at the rents in the top global financial centers recently, but this time we wanted to show you the world in a wider angle—not restricted to cities with outstanding activity in the financial sector, and bringing into the equation the affordability of local housing prices too. In its latest Cities of Opportunity report, global professional services firm PwC has set up what is basically the shortlist of the world’s best cities to work and live in. Their top-30 ranking is the result of an in-depth analysis of the most prosperous global business, finance and culture capitals, which looks at 10 different indicators—including but not limited to infrastructure, intellectual capital, sustainability and ease of doing business—, all of them essential for a great environment. With the list in our hands, our job was to find out how much money do people earn in these cities and whether these salaries are enough to afford a rental apartment. Traditionally, housing costs exceeding 30% of the household income have been viewed as a red flag, so this is also what we adopted as our first threshold. Thus, we considered the cities where the average rent was 30% or less of the local median household income to be burden-free. We also divided the remainder of the list in two: moderately (31-50% rent to income) and severely rent-burdened cities (upwards of 51%). This twist on the data puts things into a wholly different perspective. Granted, London sliding back 21 places when ranked by rental affordability is the sort of thing you may have expected to see… But what’s more impressive is that 7 out of the top 10 most affordable cities of opportunity were catapulted there straight from the lower third of the initial ranking. A stunning slingshot maneuver launched this odd trio to the top, from the 20th, 22nd and 24th places of the original ranking, respectively. Still, the two South American markets on the 4th and 5th places, Bogotá and Rio de Janeiro have moved the farthest from their original positions—22 places up from 26th and 27th. Notice that in 13 of these coveted cities, the rent-to-income ratio is comfortably below that 30% threshold. And although Tokyo, Hong Kong and Madrid technically fall into the moderately rent-burdened category, people in these cities still spend less than a third of their income to pay the rent. 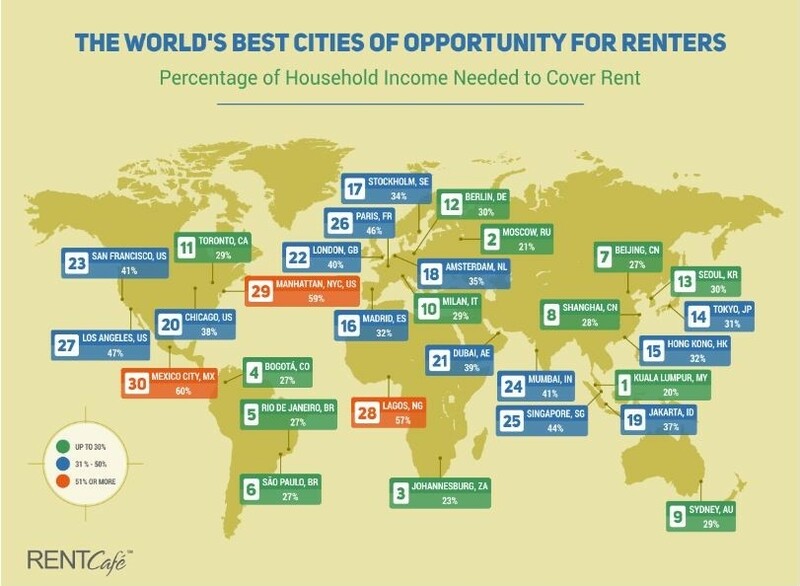 If you look at it this way, renting an apartment in more than half of the world’s cities of opportunity shouldn’t be an issue. Then again, we are talking about cities of opportunity, and what would be the use of all those opportunities if only a lucky few could afford to actually utilize them?